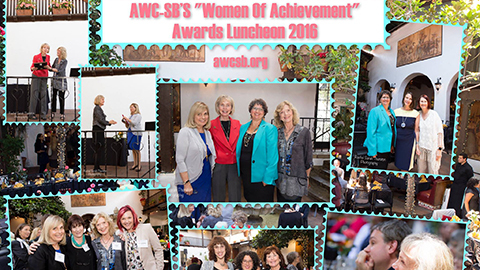 AWC-SB 9th Annual Women of Achievement Awards from Ninety Degrees Media on Vimeo. whose passion is standing women in the light. she takes matters in hand, consultant guru her claim. and half the city, traffic stopped cold. Picture this! out of the car, arms in the air, directing stop and go. by UCSB, across country. The rest is history. Renaissance woman she is, singer, poet, painter. curious about what’s next, her advice to the young. Oh Lois, you’re one to walk your talk and talk your walk! or far corners. A few words before I leave office. how dare I run for Congress after Walter passed away? and mental health of Americans, including yours. (those who really get things done), I have some guidelines. allegiance. Breathe deep, watch your breath. where I sit. Picture your most happy place. Now I ask you, is it nice to shut down the government? We’re not a grocery store, after all, or Yahoo! is secondary.” There’ve been a lot of secondary goings-on lately. grounding ourselves, play a different bipartisan game. Everyone count 1-2, 1-2 all around the room. That’s it. to the right. I know it’s a little confusing but, oh well! how are you? What do you want for your children’s future? Shake hands. Doesn’t that feel better? Trust the moment. Now be well, do good, and please, stay in touch. This entry was posted in Featured on June 11, 2016 by Lisa.